You are currently browsing Nicholas Alford’s articles. The Charles Darwin Research Station is only a 15 minute walk from our hotel. On the way there we walked past the shed where the fresh fish are prepared for sale to local hotels and restaurants. The men working there had numerous helpers. We all put our recycling out (at least I hope we do! ), but how many of us wonder what actually happens to it. Today we found out. As part of the trip we volunteered at the local recycling centre – it may not sound like a prize, but it was great fun, rewarding, hard work and a fantastic opportunity to meet some of the “real” islanders. We also learnt more Spanish that morning than any other time so far. We began the day with a tour of the facility, seeing what they were able to recycle – glass, plastics, paper, metal, organicos (anything compostable) – that was the smelly bit! As well as some of the products made from the recycled materials such as concrete that contained recycled glass. I bet that looks lovely when polished down as a floor. Then we had a tour of the interpretation centre where we learnt what the Galapagos islanders are doing to live sustainably. In many ways they are much more advanced than us back in the UK. They have been separating waste for over a decade. Then it was time to get hands on. I was assigned to help Henry on the compactor. It began with me being given a pair of latex gloves and told to climb into a trolley full of paper. I then had to load the paper into the compactor. Within 5 minutes I was drenched with sweat and the gloves were shredded, but the compactor was full. Henry then showed me how to operate the machine, I was surprised at his trust in me since he spoke no English and my Spanish only really works in restaurants. Anyway with lots of gestures and repetition I was able to compress the paper into a bale and not break the most important machine in the plant. I then learnt how to bale up the compressed paper, using a tensioner and a crimper to join the ends of the plastic strapping together. Henry and I then trolleyed the bale to the weighing station, recorded its weight (70kg) and then stacked the bale to await shipping to the mainland for processing. This was then repeated with cardboard, plastic bottles and metal cans. The morning that we spent there flew by. We all really enjoyed the camaraderie of working as part of a team. The guys that worked there had a great sense of humour, even through the language barrier. 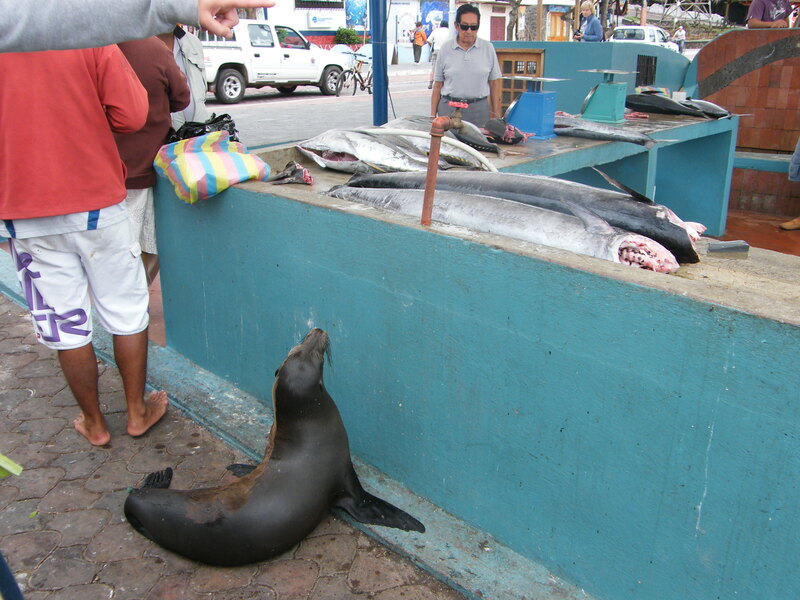 It was great to shake Henry’s hand at the end of the shift, feeling that we had done just a little bit to offset some of the harm to the Galapagos that all visitors inevitably bring with them. We were all stinking at the end, but with broad grins on our faces. Tortuga Bay gives a wonderful idea of the scale of geological time. It is made from the ground up spines of the pencil spined sea urchins that we saw whilst snorkelling on Floreana as well as the excrement they produce after eating the white corals found offshore. The sand formed in this way is very fine and a beautiful shade of white. Just imagine how many thousands or even millions of years that it must have taken for these echinoderms to form the tonnes of sand that make up most of the Galapagos Islands’ beaches. The beach is reached via a two kilometre path through the dunes from our hotel in Puerto Ayora. At the beginning of the path you sign in and out again to make sure that nobody is left on the beach when the gates are locked at 6pm. The long beach receives most of the ocean swell that comes from the south. I went there on Wednesday afternoon to check out the waves to see what sort of board I should hire. On arrival I was disappointed in the waves – a strong onshore wind was blowing the shape out of what offshore swell there was. I walked the length of the beach in the shallows (a favourite occupation of my wife, dog and I). 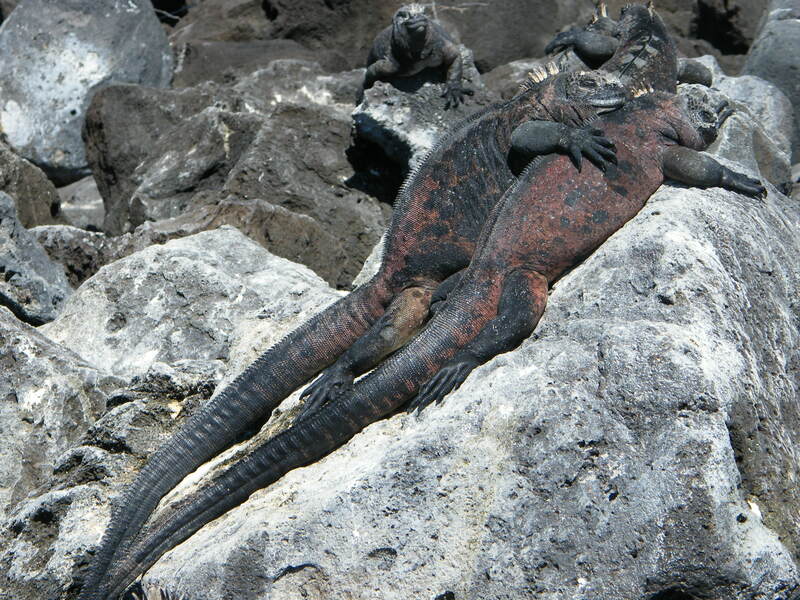 When I got to the end I got a shock as I saw what I thought was a dead marine iguana washed up on the beach. Upon closer inspection I saw it was breathing. I looked around and there were many more. They were just basking as we had seen them doing on Floreana, they just looked particularly strange against the white sand. 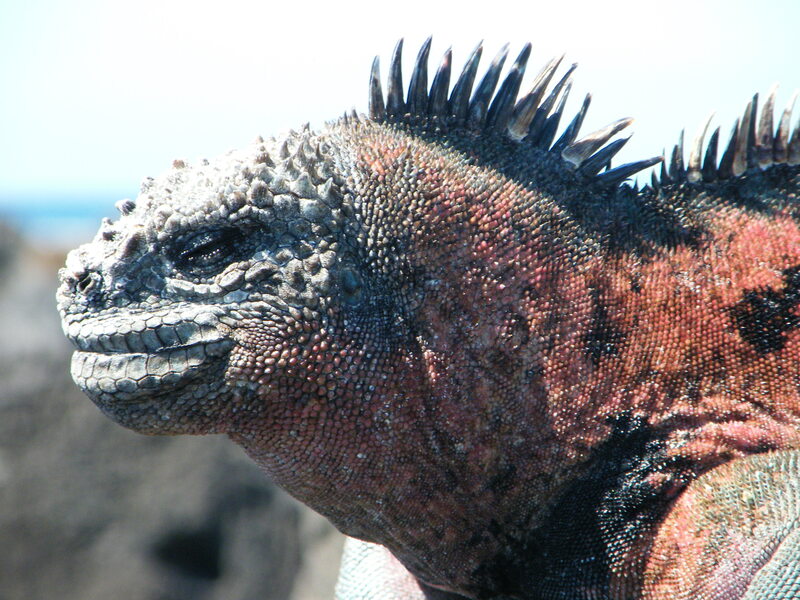 I think most were females as they lacked the vivid colours of the larger males that we had seen on Floreana. I would like to start by thanking Sheila, her students and staff for making us so welcome today at Tomas de Berlanga school. We were flung into the deep end with an English workshop with some 15-18 year old students and their teacher Todd. Our task was to make a drawing of how we had adapted to change. We then had to guess what each other’s drawings were trying to show. Right outside of my comfort zone! But it was a good ice breaker and got everyone talking. I found that 2 of the students were surfers and asked their advice on where I could find a break locally and they directed me to a shop in town where I could hire a board (more later). We then went and joined a science class – the students were approximately year 9, we tried some puzzles and looked at their preparations for their science fair. Their curriculum was much more relaxed than ours, with no formal exams. The teachers set the students projects and then assisted them when they needed help. The relationships between the teachers and the students were very informal. I suppose a class size of 4-15 helped! (It is a fee paying school). The Amys had brought books and other presents for the students which were much appreciated, as was the cuddly Welsh dragon that the girls had brought. I uploaded some of my software onto their network for them to use in their biology classes. Our students got to meet more of the Tomas students and quickly made friends, arranging to link up on Facebook. We joined a tour of the school with a party of mainly Americans from a cruise ship (lots of socks and sandals!) and then had lunch in the outdoor student cafe. 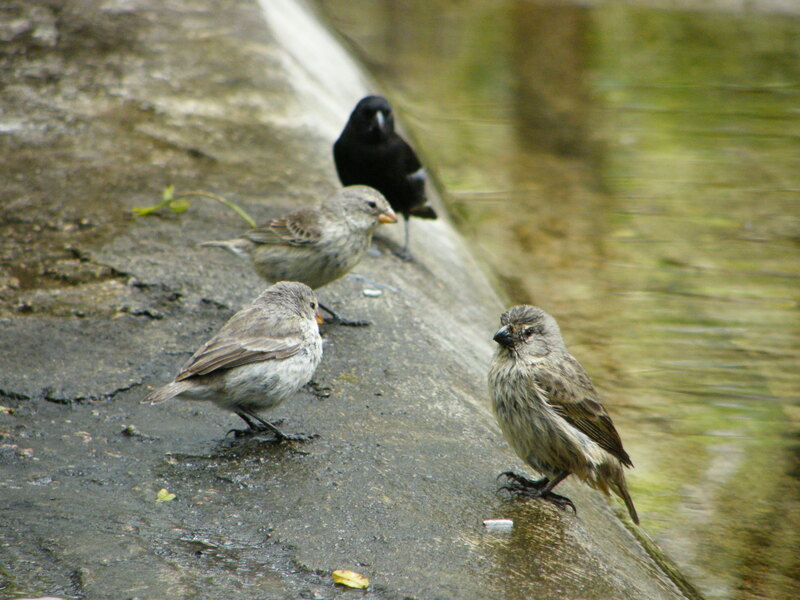 The grounds of the school were lovely with open air classrooms and playgrounds with birds hopping in and out. 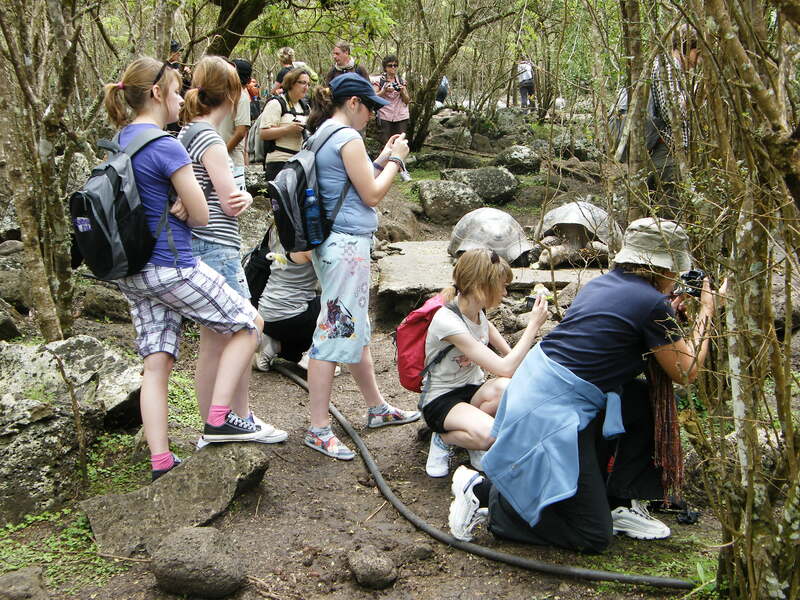 In the afternoon we went with some of the students to a farm that now specialised in providing a protected habitat for tortoises. 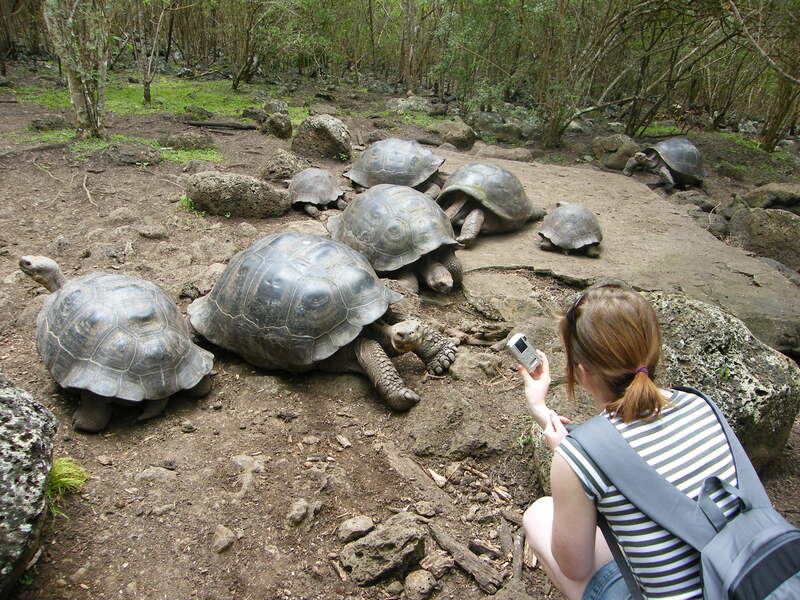 Our guides Anne and Freddie (we think we recognised Freddie from the BBC4 program on Lonesome George) were very knowledgable and showed us how they had tagged some of the tortoises (pictured in Flickr album Santa Cruz 20/10/2010 Alf) to track their movements. The males and females had their tags in different places so that they did not interfere with mating! We also learnt about the problems posed by invasive species such as brambles and guava. What a beautiful island, what a wonderful day! Sue Benjamin and I were wondering what the strange spiky things were, they looked like a cross between a sea urchin (which we also saw) and some sort of tube worm or bivalve. Will have to look those up. Or maybe someone at St Cyres could identify them and let us know. Our internet connection here is very patchy – it took about 3 hours of trying and losing the connection, followed by an upload time of over an hour to get the HD footage up. Thanks to Mun-Keat at the Wellcome Trust for his help in getting the video online. I love snorkelling – the total immersion in another, very alien world. The strange sound of your breathing, the rattling of the water in your snorkel. Taking a deep breath and diving down, the pressure on your tympanic membrane (eardrum), blowing the water from the snorkel when you float back to the surface! The relief of the first breath after a long dive. One of the first things I saw was the stingray. I spotted it below me and dived down. Judging distance underwater is very difficult – ask your physics teacher why!! So I got very close with the camera – not too near the sting though (my Dad got stung when he trod on one in Florida – his foot swelled up like a balloon). Once it saw that I had spotted it – it was off. I had to kick with my fins as fast as I could to keep up. I was soon out of breath and had to drift back up to the surface and then dive down again. An amazing experience to have such a close encounter. The turtle was amazing. Our guide said that another boat had spotted a turtle so we swam to where it had last been seen. I got separated from the girls and our guide, spun round to see where they were and this massive shape loomed towards me out of the gloom. It noticed me noticing it and changed direction. I followed (messing up the filming at the same time). Again once it knew it was being followed it gave a mighty stroke with its front flippers and pulled away from me. I tried to keep up, but it was like a motorbike pulling away from a pushbike. So well adapted to its habitat – its swimming was effortless whilst I kicked as hard as I could in a vain attempt to keep up. Also saw lots of fish, though the footage of this was too jerky for the final edit. Will slow down and try for more panning shots, rather than blindly chasing everything that moves in the future! The boat ride to Floreana was amazing. Karen, Amy S and I were up on the top of the boat, and though it was very windy and sore on the (un-cushioned) behind as we bumped over the impressive swell coming in (more about this later) we had a great view of the journey. Just pulling out of the harbour we saw sea lions basking on fishing boats and pontoons. In the open water we were followed by blue footed boobies and albatrosses. They were able to keep up with our boat. We were probably doing 20 knots, and they used their incredible wings to generate motion from the force of the air moving over the waves. 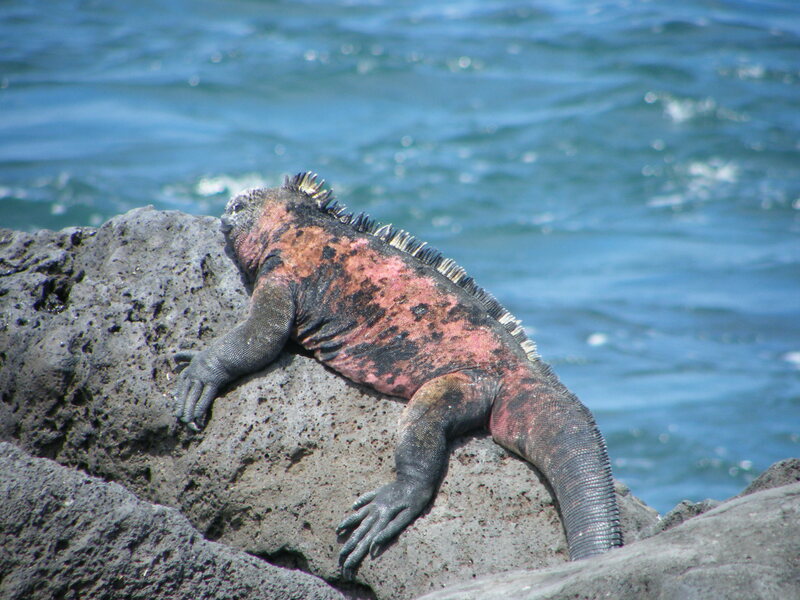 Getting off the boat we climbed onto the quay and straight in front of us was my favourite animal – a marine iguana, just basking in the sun! 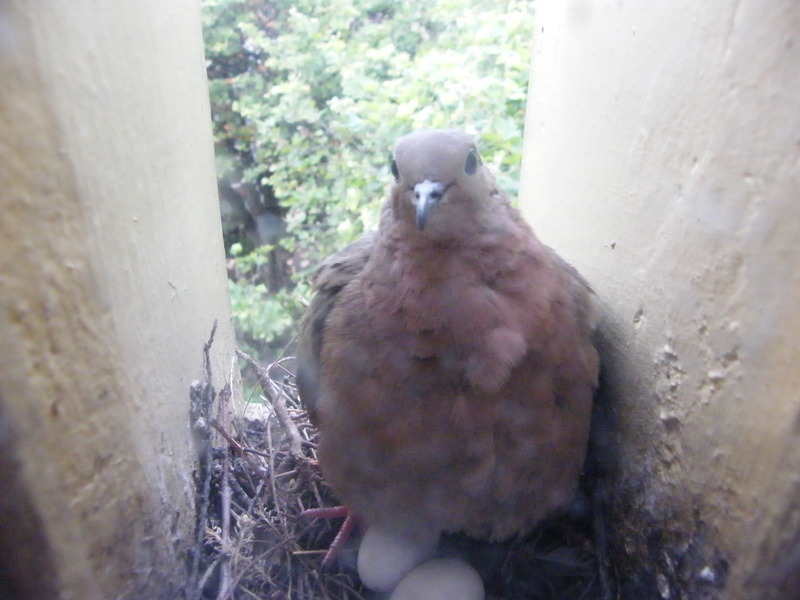 We had 15 minutes later in the day to film them. We clambered over the rocks between them, passing within a metre of them. In fact you had to watch that you didn’t stand on one there were so many of them!! 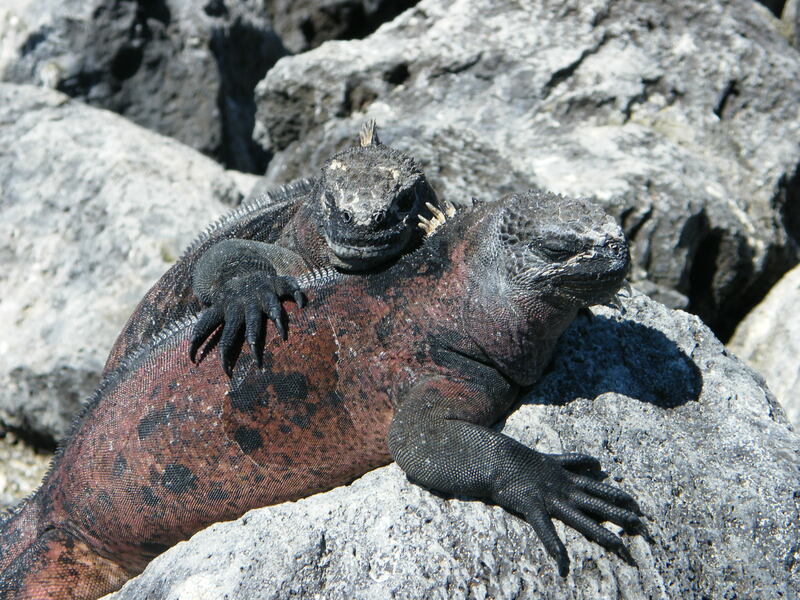 The marine iguanas were amazing – they just lay there on the rocks in the sun, warming themselves up so that their core body temperature rose enough to give them the energy to swim in the relatively cold water (caused by the Humboldt current) to graze on seaweed stuck to the bottom. Occasionally you would hear a snorting sound as they sneeze out a spray of concentrated brine to excrete the salt that accumulates in their bodies. Amazing animals – such a prehistoric look to them. 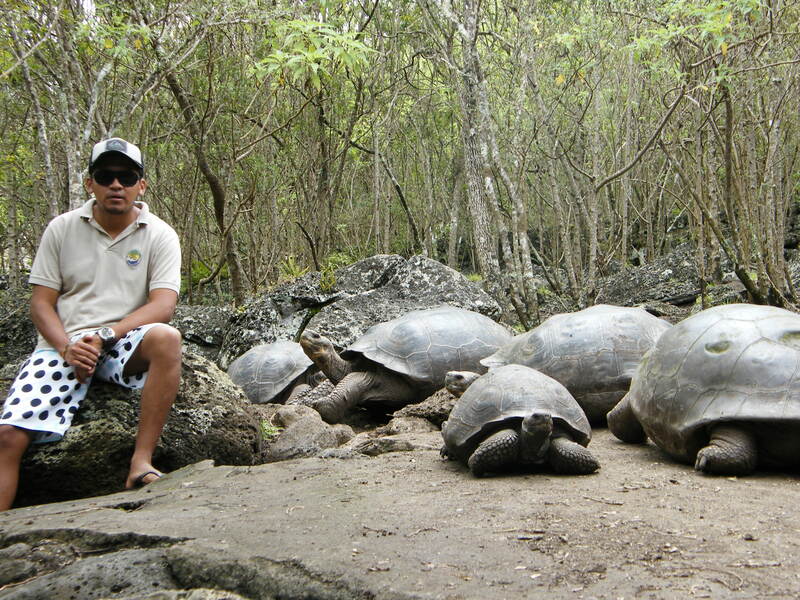 Definitely number one on my must see list of the Galapagos. In the morning we had been up to a tortoise sanctuary high up in the mountains. 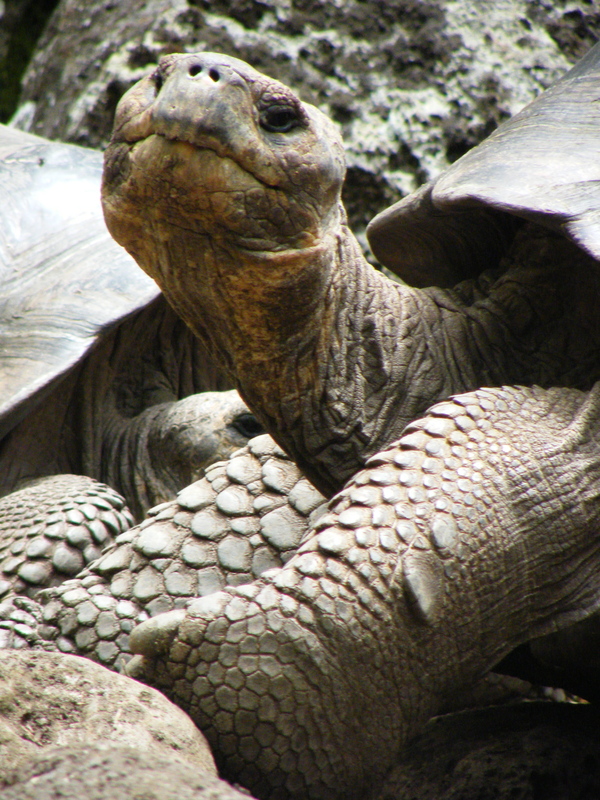 At that climate the forests are watered by a mist that provides the lush vegetation that the tortoises enjoy. 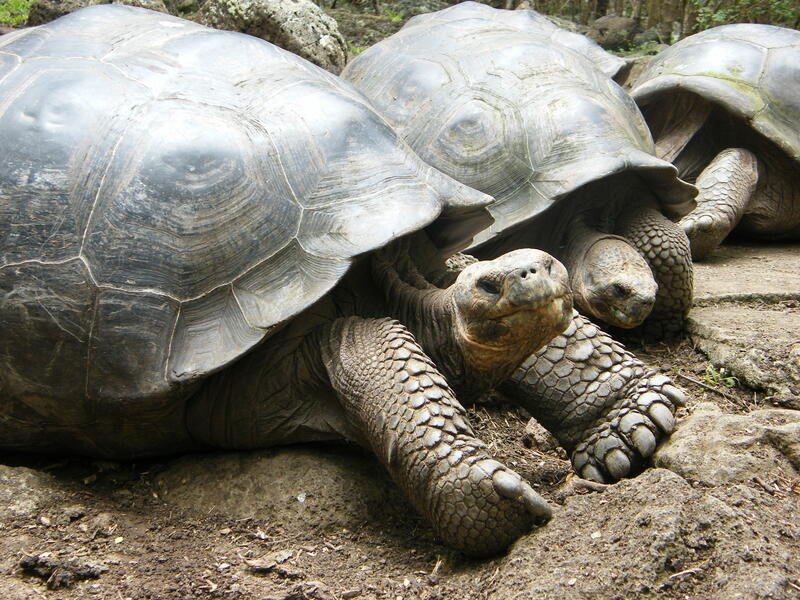 Because the climate is moist the tortoises found on Floreana do not have a high saddle like part of their shell as they do not have to reach up to eat. Before the journey back to Santa Cruz, our boat took us around the coast where we saw a Galapagos penguin, a heron, frigate birds and tropic birds. See the Flickr site for images of these. All in all, an amazing day on a beautiful island. We are off to a local school today. Looking forward to meeting the children and teachers. I only hope I don’t fall asleep in class after 3 hours sleep due to the time it has taken to edit the video and upload the blog to the internet! 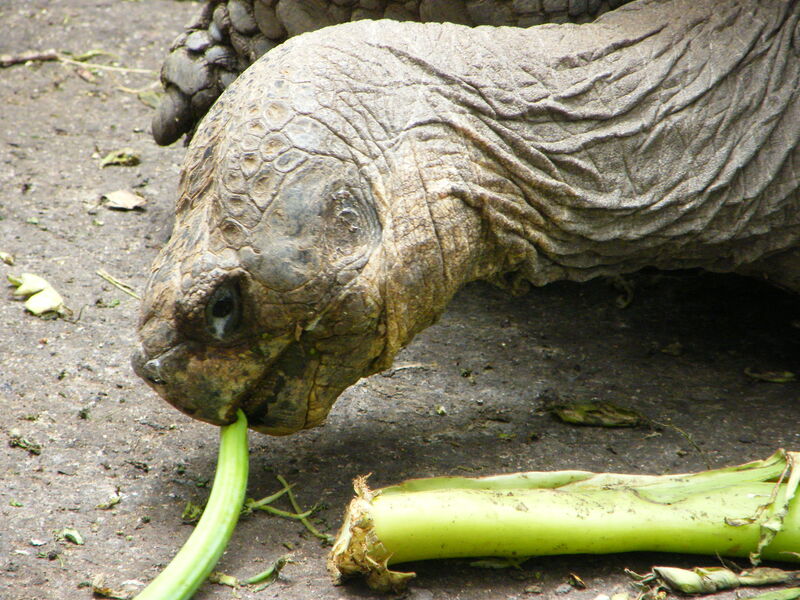 The Survival Rivals team discovered a new species of tortoise after spending less than a day on the islands…. Please suggest some latin names…. 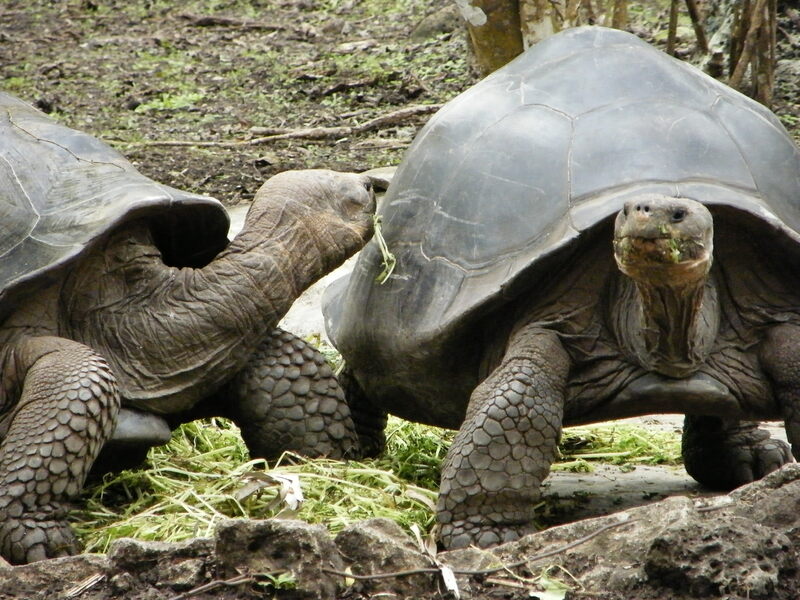 Well we are finally on the last leg of the trip to the Galapagos. Have just taken off from Guayaquil. We land on the tiny island of Baltra and then catch a ferry across to Santa Cruz. 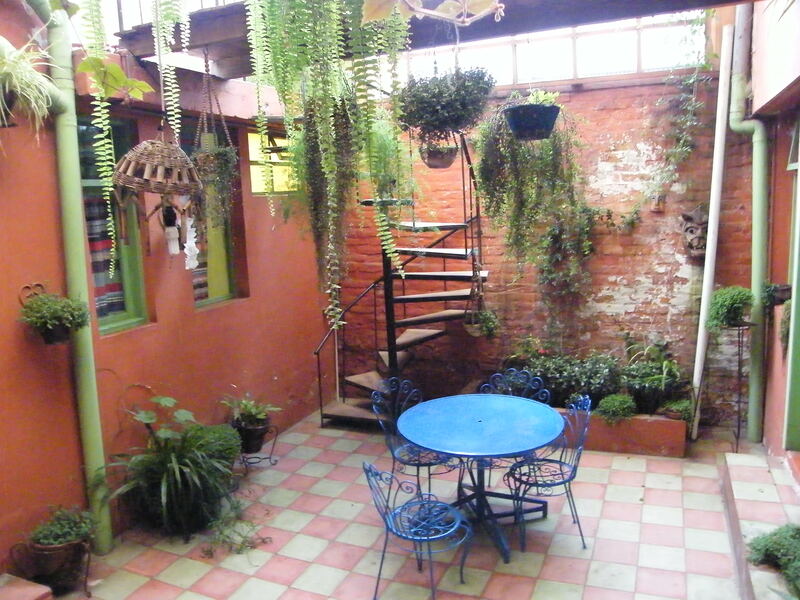 Then it is up to the mountains to a tortoise sanctuary, and the adventure properly begins. We’ve arrived in Quito – and have wireless at the hotel! 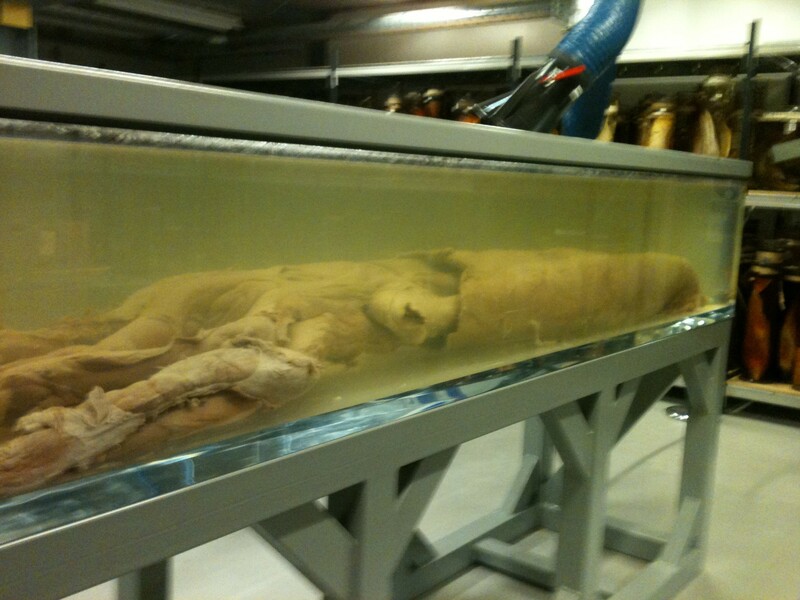 Among the things we saw were the Darwin letter to his wife, Emma, asking her to publish On the Origin of Species in the event of his untimely demise, a signed first edition of the book, a preserved giant squid (pictured above, including a close up of the tentacles – the suckers were bigger than a £2 coin!) 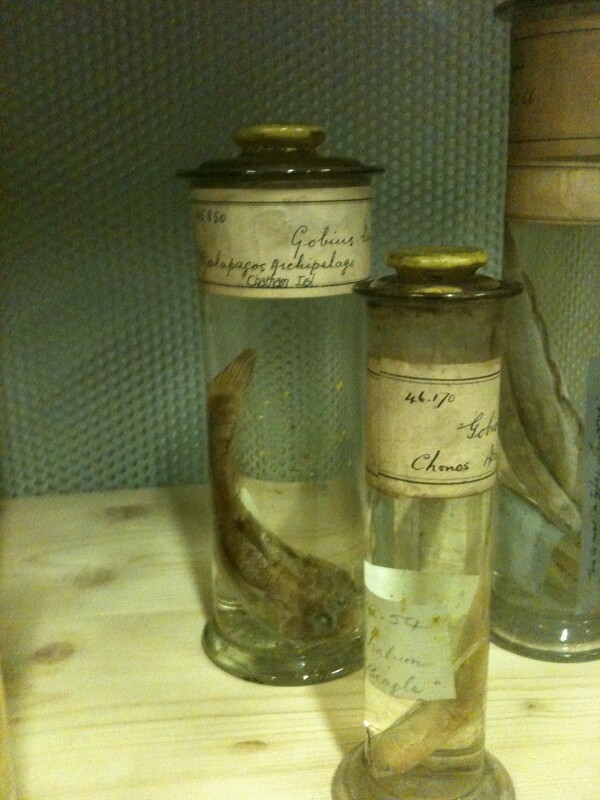 and some of the original specimens collected from the voyage of the Beagle with Charles Darwin’s labels still intact. Awesome!! 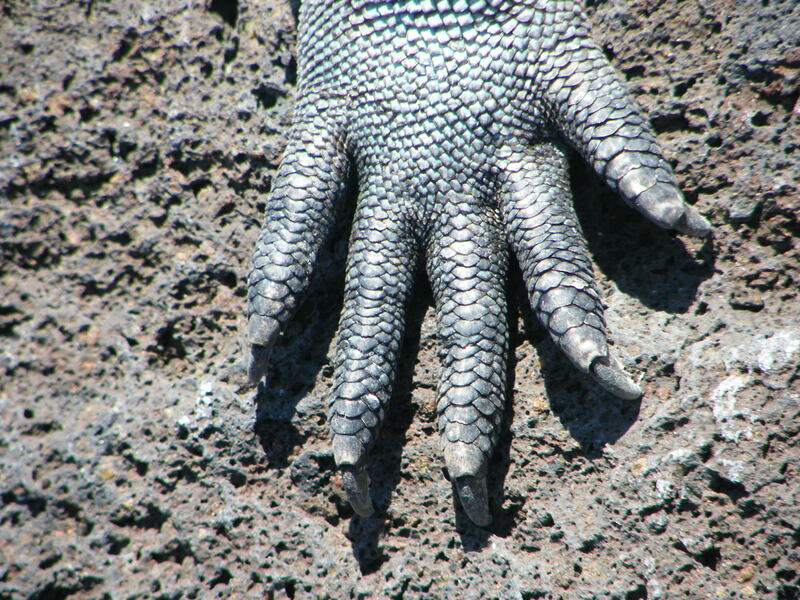 I have really developed a taste for all things Galapagos. While working on the risk assessment for the trip, the news came in from Quito about the President!! How do we allow for that!!? Thankfully things seem to have calmed down. Can’t wait ’til our departure next Friday.